Here's a typical 19th-century confrontation in the "Wild West." 1) White settlers move into Native territory and set up permanent residence without permission. 2) Someone, perhaps a young Native warrior, steals a settler's horse. 3) Military commander demands other Natives return the horse. Natives understandably refuse. 4) Commander sends posse of men to arrest Natives for horse theft. Gunfight ensues. 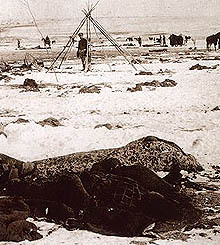 Several Natives and one white man are killed. 5) Settlers demand vengeance. Commander sends troops to arrest Natives for the white man's murder. 6) Soldiers massacre 10-20 Native men, women, and children while arresting "killers." 7) Native "killers" are condemned for murder without a trial and hanged. 8) Settlers are finally satisfied that they've received justice for the stolen horse. Repeat until the Army sends in a massive force to hunt all the Indians in the territory and confine or remove them. The above scenario comes courtesy of Blood and Thunder, a book I just finished. It offers a revealing look at life on the southern frontier of New Mexico. P.S. Sometimes just a dispute over a horse race was enough. Unbelievably, a stolen horse was not the worst excuse for a massacre ever. Is Captain Kirk a conservative? Cornsilk: Smith "is not a Cherokee"
"From Tiger Lily to Green Inferno"
Smith's defenders denounce "identity policing"